Clogged drains are not only a serious nuisance, they can become very costly if left untreated. Clogged drain repair services can help keep your Norman, Oklahoma plumbing system running smoothly and prevent major repairs down the road. The NuFlow Oklahoma team is ready to help with your drain issues – large or small. NuFlow Oklahoma has a professional, courteous team in Norman prepared to tackle your bathroom or kitchen clogged drains, slow-draining sinks, or foul odor emissions that can stem from clogged drains. Our Norman OK plumbers work with state-of-the-art equipment that allow us to deliver quality clogged drain repair services in a speedy, effective manner. The NuFlow Oklahoma team walks you through the plumbing issue, presents possible solutions, and helps you make the best decision based on your needs and your budget. The Norman clogged drain repair workmanship offered by NuFlow is convenient and affordable. Do I Need a Plumber for Clogged Drain Repair? Before you call the professionals, you may try do-it-yourself clogged drain repair options. However, chemicals, plumbing snakes, and plungers are just a short-term solution to what could quickly become a major issue. Liquid cleaners are filled with chemicals that can damage your pipes or cause them to corrode more quickly. Routine maintenance to your home’s plumbing system will help you avoid the need for clog drain repair services. But when you need help, NuFlow technicians are ready to assist. Everyday use of your sinks, tubs and showers cause residue and buildup to line your pipe system. When left untreated, the buildup can affect the taste of your water as well as the flow of water to and from your home. Avoid costly repairs or pipe replacement by scheduling regular maintenance from the NuFlow Oklahoma professionals. 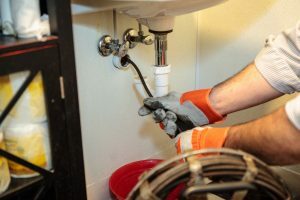 If any of these factors are affecting your plumbing, it’s time to call for clogged drain repair Norman OK technicians who can resolve the issue with the least invasive method possible. The NuFlow technicians can help solve the issue and suggest maintenance check ups to keep your plumbing running smoothly.